For other uses, see Davy Jones' Locker (disambiguation). Euphemism for sea floor, or resting place for sailors drowned at sea. Davy Jones' Locker, also Davy Jones's Locker, is an idiom for the bottom of the sea: the state of death among drowned sailors and shipwrecks. It is used as a euphemism for drowning or shipwrecks in which the sailor(s)'s and/or ship(s)'s remains are consigned to the bottom of the sea (to be sent to Davy Jones's Locker). The origins of the name of Davy Jones, the sailors' devil, are unclear, with a 19th-century dictionary tracing Davy Jones to a "ghost of Jonah". Other explanations of this nautical superstition have been put forth, including an incompetent sailor or a pub owner who kidnapped sailors. The earliest known reference of the negative connotation of Davy Jones occurs in the Four Years Voyages of Capt. George Roberts, by the author Daniel Defoe, published in 1726 in London. Some of Loe's Company said, They would look out some things, and give me along with me when I was going away; but Ruffel told them, they should not, for he would toss them all into Davy Jones's Locker if they did. 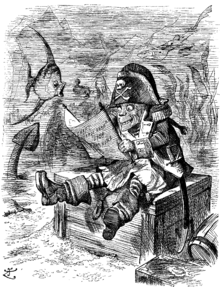 This same Davy Jones, according to sailors, is the fiend that presides over all the evil spirits of the deep, and is often seen in various shapes, perching among the rigging on the eve of hurricanes:, ship-wrecks, and other disasters to which sea-faring life is exposed, warning the devoted wretch of death and woe. He’s gone to Davy Jones’s locker, i.e. he is dead. Jones is a corruption of Jonah, the prophet, who was thrown into the sea. Locker, in seaman’s phrase, means any receptacle for private stores; and duppy is a ghost or spirit among the West Indian negroes. So the whole phrase is, "He is gone to the place of safe keeping, where duppyy Jonah was sent to." David Jones, a real pirate, although not a very well-known one, living on the Indian Ocean in the 1630s. Duffer Jones, a notoriously myopic sailor who often found himself overboard. A British pub owner who supposedly threw drunken sailors into his ale locker and then gave them to be drafted on any ship. He may be the pub owner who is referenced in the 1594 song "Jones's Ale is Newe". Linguists consider it most plausible that Davy was inspired by Saint David of Wales, whose name was often invoked by Welsh sailors, and Jones by the Biblical Jonah. Not all traditions dealing with Davy Jones are fearful. In traditions associated with sailors crossing the Equatorial line, there was a "raucous and rowdy" initiation presided over by those who had crossed the line before, known as shellbacks, or Sons of Neptune. The eldest shellback was called King Neptune, and Davy Jones would be re-enacted as his first assistant. He came, said he, in a storm, and he went in a storm; he came in the night, and he went in the night; he came nobody knows whence, and he has gone nobody knows where. For aught I know he has gone to sea once more on his chest, and may land to bother some people on the other side of the world; though it is a thousand pities, added he, if he has gone to Davy Jones's locker. In Edgar Allan Poe's "King Pest" of 1835, Davy Jones is referred to dismissively by the anti-hero, Tarpaulin, when King Pest refers to "that unearthly sovereign" "whose name is Death." Tarpaulin responds, "Whose name is Davy Jones!" There was young Nat Swaine, once the bravest boat-header out of all Nantucket and the Vineyard; he joined the meeting, and never came to good. He got so frightened about his plaguy soul, that he shrinked and sheered away from the whales, for fear of after-claps, in case he got stove and went to Davy Jones. "It was a maxim of Captain Swosser's", said Mrs. Badger, "speaking in his figurative naval manner, that when you make pitch hot, you cannot make it too hot; and that if you only have to swab a plank, you should swab it as if Davy Jones were after you." In Robert Louis Stevenson's 1883 novel Treasure Island, Davy Jones appears three times, for example in the phrase "in the name of Davy Jones". 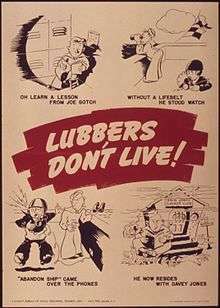 World War II poster makes reference to Davy Jones's Locker. [n 1] A "lubber" is a clumsy or careless sailor (from landlubber, naval slang for a greenhorn). And hey for Davy Jones. The 1959 Broadway musical Davy Jones' Locker with Bil Baird's marionettes had a two-week run at the Morosco Theatre. Late 20th-century songs that refer to Davy Jones include Paul McCartney's song "Morse Moose and the Grey Goose" and the Beastie Boys' song "Rhymin and Stealin". In the English translations of The Adventures of Tintin, the character Captain Haddock makes occasional references to Davy Jones. Also, Secret of the Unicorn, on page 17, while recounting Sir Francis Haddock's manuscript to Tintin, references a pirate ship raising the red flag and says, "The red pennant!... No quarter given!... A fight to the death, no prisoners taken! You understand? If we're beaten, then it's every man to Davy Jones's locker!" However, it is not the case in the original version, since the idiom only exists in English (in French, he uses another archaic French idiom, "Que le Grand Cric me croque ! ", which is not particularly related to sailors and has nothing to do with Davy Jones). In the Genesis song "Dodo/Lurker" from the 1981 album Abacab, the sixth stanza has the lyrics: "One he got a dream of love, deep as the ocean Where does he go, what does he do? Will the siren team with Davy Jones, And trap him at the bottom of the sea?" The Iron Maiden song "Run Silent Run Deep" (about submarine warfare) contains the lines: "The lifeboats shattered, the hull is torn/The tar black smell of burning oil/On the way down to Davy Jones/Every man for himself – you're on your own..."
The band Clutch have a song entitled "Big News I", which says, when played backwards, "them bones, them bones, them dry, dry bones/ Come down to the locker of Davy Jones". In the 1960s television series The Monkees episode "Hitting The High Seas", the character Davy Jones (played by musician Davy Jones) receives special treatment while kidnapped in a ship as he claims to be related to "The Original" Davy Jones, his grandfather. Meanwhile, his fellow band members are held hostage, leading to various humorous situations. The fact that Jones the musician shared a name with the legendary seafarer has itself led to a number of puns swapping the two in the decades that followed. In the 1994 movie The Pagemaster, Adventure (Patrick Stewart) and Richard Tyler (Macaulay Culkin) are shipwrecked, and when Richard Tyler asks what happened to Fantasy and Horror, Adventure sadly replies,"I'm afraid they've gone below to Davey Jones." The Tears for Fears song "Don't Drink the Water" from the 1995 album Raoul and the Kings of Spain contains the lines: "I saw you swim / Sink to your grave / Down to Davy Jones' locker / Under the waves..."
The concept of Davy Jones was conflated with the legend of the Flying Dutchman in the Pirates of the Caribbean film series, in which Davy Jones's locker is portrayed as a sort of purgatory, with Davy Jones being a captain assigned to ferry those drowned at sea to the afterlife before he corrupted his purpose out of anger at his betrayal by his lover, the sea goddess Calypso. Davy Jones is portrayed in the movie as an enigma of the sea, featuring octopus tentacles for a beard and crab claw for a hand. The origins of Davy Jones and Calypso are revealed in the stand-alone novella "Davy Jones & the Heart of Darkness". The Scottish origins are consistent with the legend, but this novella includes Davy's training in Inferno with Charon, the ferryman of Hades. The tale is written by Dave Montalbano and illustrated by Rachel Galvin. In the video game Banjo-Tooie, on the Jolly Roger's Lagoon level, the player can swim to the bottom of the lagoon and find a giant locker with the name "D. Jones" on it. Destroying the locker will open a path to the level boss. The term has also been used repeatedly in the animated TV series SpongeBob SquarePants to represent an actual locker in the bottom of the sea where Davy Jones (of The Monkees fame) keeps his gym socks. Players of the 21st-century real-world treasure-hunting game of Geocaching have been inspired to hide a number of geocaches containing a reference to Davy Jones's Locker. Adam Carolla has repeatedly used or referenced the term on his daily podcast, The Adam Carolla Show. The Devil Makes Three references the idiom on their single "The Plank". Sleeping With Sirens references Davy Jones on their song "Don't Fall Asleep At The Helm". In his novel The Last Dickens, Matthew Pearl makes the Captain of the Samaria transatlantic liner assume that Herman the Parsee might be "sleeping soundly in Davy Jones's locker", namely that he "has almost certainly perished in the depths." Use of seamen jargon chimes with the dickensian topic and environment of the novel. French singer Nolwenn Leroy recorded a song titled "Davy Jones" for her 2012 album Ô Filles de l'Eau. The English version contains the lines: "Davy Jones, oh Davy Jones / Where they gonna rest your bones / Down in the deep blue sea / Down in the deep blue sea..."
American surf-rock/punk band Rusty Shipp released a song in late 2012 titled "Davy Jones Ain't Got Nothin' On Me", which makes several references to Davy Jones's Locker, and also is believed to make reference to the "Flying Dutchman" myth. This is especially prevalent in the lines: "all of the sudden, a ghost ship appears/with a crew of souls whose singing I hear". Monster High character Dayna Treasura Jones is the pirate daughter of Davy Jones. 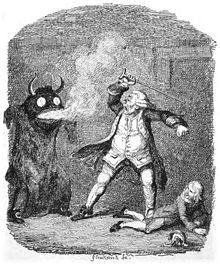 ↑ However, presented here character is a fake, created by Pipes, Perry and Pickle to scare Mr. Trunnion; see: Smollett, Tobias (1751). The Adventures of Peregrine Pickle. London: D. Wilson. p. 66. 1 2 3 Farmer, John S; Henley, William Ernest (1927). A Dictionary of slang and Colloquial English. pp. 128–129. ↑ Farmer, John Stephen; Henley, W. E. (1891). Slang and its analogues past and present: A dictionary ... with synonyms in English, French ... etc. Harrison & Sons. p. 258. Retrieved 16 January 2013. 1 2 3 4 Brewer, E. Cobham (1898-01-01). "Davy Jones's Locker.". Dictionary of Phrase and Fable. Retrieved 2006-04-30. ↑ Defoe, Daniel (1726). The four years voyages of capt. George Roberts. Written by himself. p. 89. 1 2 Michael Quinion (1999). "World Wide Words". Retrieved 15 January 2013. ↑ Rogoziński, Jan (1997-01-01). The Wordsworth Dictionary of Pirates. Hertfordshire. ISBN 1-85326-384-2. ↑ "August 22, 2014 Word of the Day: Davy Jones's Locker". Retrieved 23 August 2014. ↑ Connell, Royal W; Mack, William P (2004-08-01). Naval Ceremonies, Customs, and Traditions. pp. 76–79. ISBN 9781557503305. ↑ Irving, Washington. "Adventure of the Black Fisherman". Free Online Library. Retrieved 2010-03-17. ↑ Poe, Edgar Allan (1835) "s:King Pest"
↑ The Oxford Illustrated Dickens, page 229. ↑ George Lottman (2007). "The US Navy". The US Navy. Retrieved 2008-02-28. ↑ "Davy Jones' Locker @ Morosco Theatre". Retrieved 2016-09-25. ↑ "Clutch Lyrics". Retrieved 2 February 2013. ↑ "Davy Jones' Locker". Retrieved 2010-03-17. ↑ "Geocaching: GC5DJ07". Retrieved 2014-10-01.